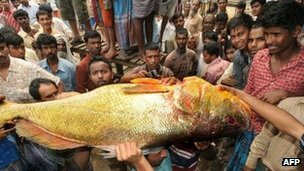 A Chinese businessman has paid $38,000 (£24,000) for a rare golden snapper fish caught on Thursday in the port city of Chittagong, fish traders say. The unidentified businessman from Hong Kong bought the 37kg (82lb) fish "for its tasty bladder and succulent flesh", seller Jahangir Saudagar told AFP. He bought the fish at an auction before selling it on to the businessman. Only about four snappers - considered a delicacy - are caught in the Bay of Bengal every year, experts say. Mr Saudagar, who works at a fish market near Chittagong, bought the fish from fishermen returning from the Bay of Bengal late on Wednesday. "I continued to bid until everyone else gave up because I knew I could sell this fish on at (a high) price," Mr Saudagar said. Forte : kalau ada geng yang dapat Ikan Jenahak, jual di Hong Kong...mahal....hehehe.